Unsurprisingly, Paramount is reportedly about to finalize Michael Bay's return to the constant money-maker that is the Transformers film series. Remember how, a couple of months ago, it was revealed that Michael Bay was being courted to direct the next two Transformers films? Also, remember how folks on the forums proceeded to weep at the knowledge that their childhood nostalgia was probably to be brutalized again? Well, guess what? It's time to upgrade "probably" to "almost definitely", since it's just been revealed that Michael Bay is in final negotiations to helm the movies (even though he originally denied such reports). 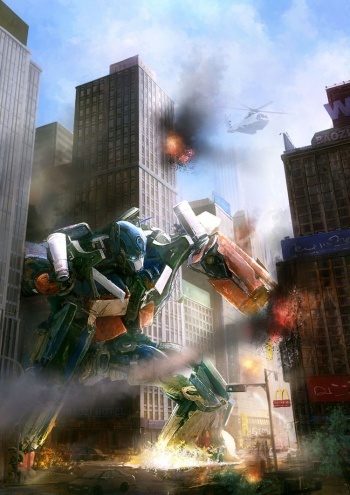 Michael Bay is in final negotiations to direct a new Transformers film, insiders tell Vulture. Another insider familiar with the situation cautioned that while Paramount "does not have a closed deal" with Bay, the studio "is not far from closing" on one, either, and that an announcement could come as early as next week. Meanwhile, the details of the next cyborg saga are being kept secret, but we're told that it is definitely not a prequel, and that it will delve deeper into the Transformers canon to mine older characters and lore. "Regular people might not care about bringing out a character like Sentinel Prime," says one of our insiders, referring to the little-known character who played a major part in last summer's Transformers: Dark of the Moon, "But believe me, fans of the series cared." Bay is reportedly going to film Pain & Gain, which sounds like an action-heavy revenge film, before he returns to Transformers. Provided that his people nail down a contract for the next Transformers movies, Bay will allegedly start directing them sometime during Winter 2012.